Stephanie Potier, a native of Canada teaching French in West Bloomfield, Michigan, has shared this report on her class activities in honor of French Canadian Heritage Day 2014. Thank you to Madame Potier and to all of her students for taking part in this special heritage day, and for sharing your activities with the wider community! 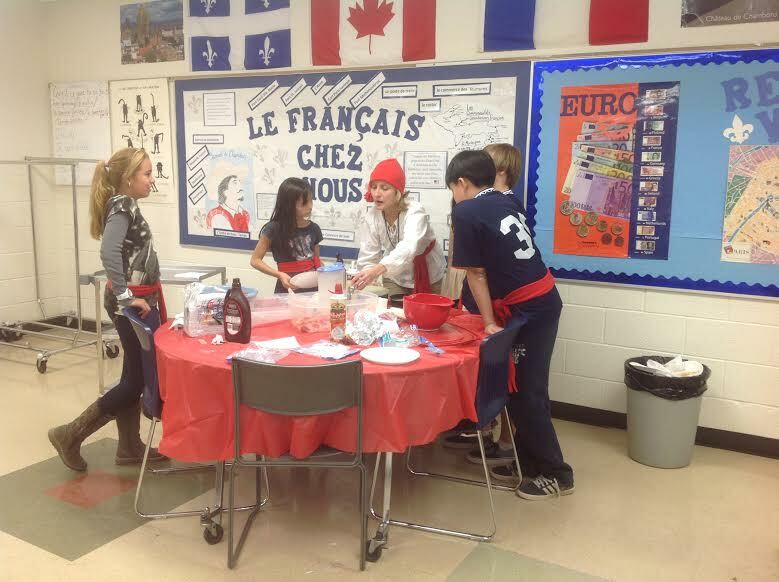 Teacher with students, preparing crepes for French Canadian Heritage Day. 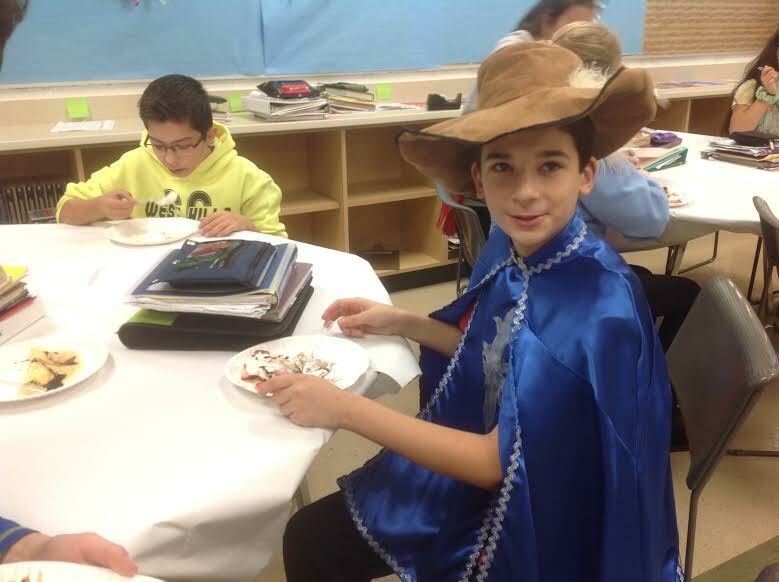 Eighth-grade French students at West Hills Middle School in West Bloomfield became “inquirers” and “voyageurs” (French Canadian fur traders) as they conducted an inquiry into the first French settlers and settlements in New France and Michigan beginning in the early 1600’s. Naturally they uncovered some very fascinating facts! Did you know that our very own Detroit was a French fur trading post called Fort Ponchartrain du D’étroit (meaning the narrows between Lake St. Clair and Lake Erie) established in 1701 by a Frenchman named Sieur Antoine de la Moth Cadillac? Young ladies wearing the ceinture flechee and tuque for Mrs. Potier’s French Canadian heritage celebration. In addition another remarkable fact was discovered – a 16 year old boy named Etienne Brûlé sailed from France with Samuel de Champlain in 1608, was sent to live amongst the Huron and Algonquin to learn their language and customs and became an interpreter and scout for Champlain “The Father of New France.” He is believed to be the first coureur de bois (runner of the woods) to give an oral account of his explorations to the Great Lakes. There is an abundant amount of French history so close to home and it really quite amazing! Champlain, or perhaps Étienne Brûlé, enjoying crépes! 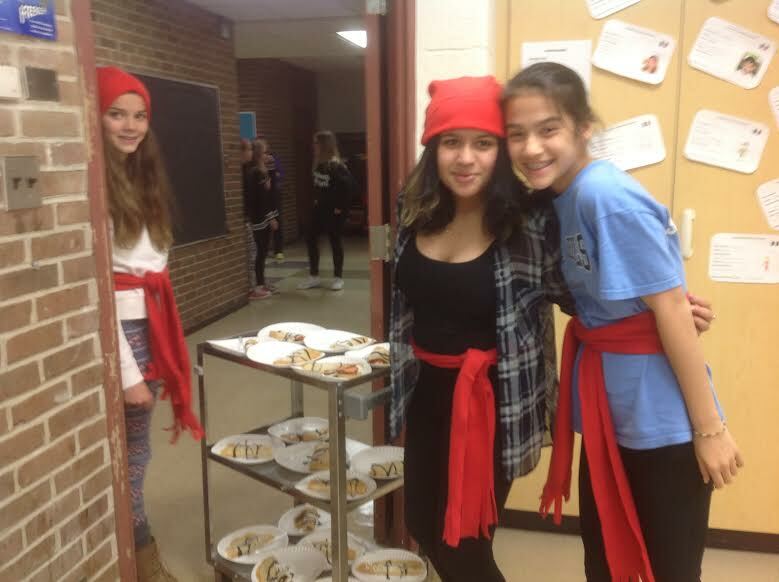 French students in 6th and 7th grade also shared in this special day by making and sharing “crêpes,” singing some traditional songs, learning some French cultural facts, dressing as voyageurs and taking our annual group pictures. They celebrated according to Champlain’s “L’Ordre du Bon Temps”(Order of Good Cheer). What a fun cultural experience for all!